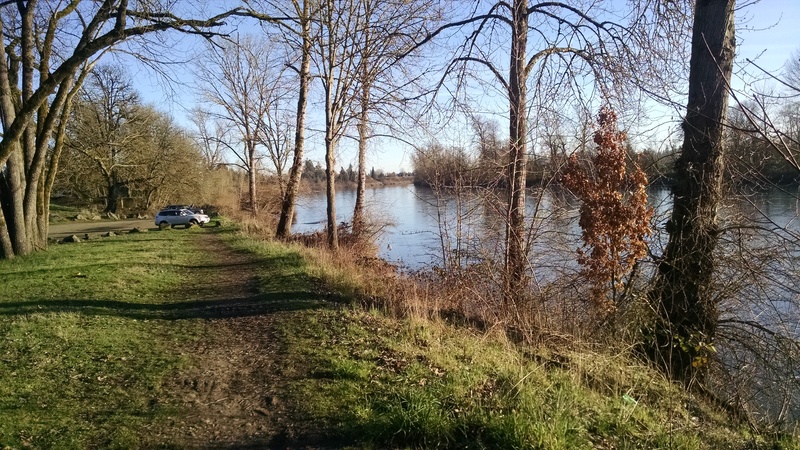 I did not know there was a path along the river behind the Super 8 Motel in Corvallis. Last time I was here, everything was covered in snow and ice. I walked cautiously in my boots, afraid of slipping, my fingers freezing despite my gloves as I snapped pictures in a quiet wonderland covered in white. The temperature was about 12 degrees. 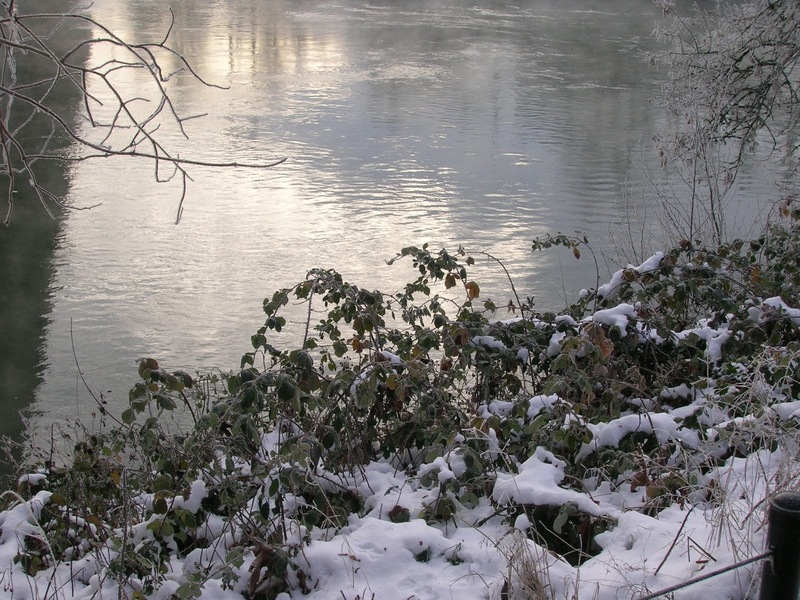 Even the edges of the Willamette River were frozen. A rogue snowstorm had caught western Oregon by surprise. I was on my way home from San Francisco, where my father had just had heart surgery. There, it was cold but clear. When I landed at the Portland airport, I found my car encased in snow. I had trouble starting it, and my tire warning light was on. My feet slipped on the icy pavement. But I got onto I-5, drove south on partially cleared roads and took the turn onto Highway 34 toward the coast. That road had not been plowed. I crept along in a line of cars sliding all over and vowed to stop at the first motel I found. That was this Super 8 in Corvallis. For two days, I was snowed in, not daring to drive the rest of the way home. I walked along the river, and I walked into the town, enjoying the local stores and restaurants that were still open. Everything was quiet. No cars. All sounds muffled by snow. This morning is a different story. The snow is gone, and the sun is shining. It’s still cold, but no danger of frostbite. I walk slowly, still favoring the ankle I sprained in December. Cars and trucks roar by on Highway 34, exiting at second street, stopping at the traffic light. Along the river, the trees and shrubs are still winter bare, but now I can see the dirt. I can also see the litter, including evidence of drug use. Crows squawk at me from the trees, and a squirrel as big as a cat whooshes by. A homeless guy shouts good morning and mumbles something about fog. Fog? A jogger runs by in yellow shorts, and an old lady urges her equally old golden retriever along. Without the snow, it’s a different world. I’m not as charmed by the all-carb motel breakfast and tea in a Styrofoam cup or the bathtub stopper that growls unless you hold it down with your foot. I’m all too aware of the work and meetings facing me back on the coast, all needing my attention today. I cannot claim a snow day. But as I watch the river flowing by and the sun shining off the blue water, I’m glad I decided to stop here on my way home from a meeting in Portland and not just so I wouldn’t miss any of the three-hour “Bachelor” marathon on TV. There’s something about a river that feels like a prayer.